ChipsAway franchise business opportunity. 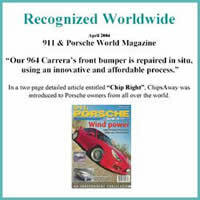 Free ChipsAway business franchise information. Business Opportunity For Car Enthusiasts! No office or workshop required. ChipsAway's Licensee typically works from a cargo van or trailer. Start your new business full-time or retain your job and work part-time nights and weekends. Build up your customer base and then go full time. Walk through any parking lot and just count the number of new and late model vehicles with stone chips, key scratches and bumper scuffs. ChipsAway has been recognized as the high quality choice for automotive paint restoration throughout the world since 1988. Our combination of classroom and hands-on training classes insure that regardless of your experience, upon completion of the course, you will produce high quality repairs that will amaze even the experts. ChipsAway Inc. has developed a specially formulated painting system consisting of ingredients unique to ChipsAway. We use only chemicals and equipment that meet or exceed the health, safety and environment standards set by governmental agencies. Our policy has always been to provide our Licensee's with equipment that has been subjected to months of testing by our own in-house technical staff. The right tools can make the difference between success and failure! Our relationship only begins when you complete training. We are always only a phone call away when you have questions, need help finding a paint formula or resolving technical issues. Our Technical Support staff and Trainers are actual hands-on technicians who make repairs daily in our own service center. As a ChipsAway Licensee, you will enjoy the benefits that come with starting a new business with an established name and reputation. Our experienced marketing staff will guide you through start-up and continue to share ideas on marketing to grow your sales and increase your profits. To learn more about the ChipsAway automotive service business opportunity, simply complete the form below.